Graphic stories I’ve written, obviously. Just because I happened to take a ton of Beat L.A. copies home with me, I figured that I’d do the sporting thing and put together a little giveaway on Goodreads for 12 shiny and sparkling new copies. As the below-inserted widget unmistakably indicates, the giveaway ends on June 12, which means that you only have X-amount of days left to enter, depending on when you’re reading this. Hopefully you catch it sooner than later, as I’d obviously love to give a copy away to one of the 5-ish someones who take the time to peruse the glowing character-fields of Minefield Wonderland before other someones who, say, either don’t come here or are anonymous to this site. Granted, given the Guardian article published yesterday that the NSA were collecting everything on us short of the DNA samples we drop every day, I wouldn’t blame most people for throwing away their cell phones, paying everything in cash, storing their money is Bitcoin containers, taking on avatars, handles, both and/or many of each, and operating only in private-browsing mode from nondescript locations at the far fringes of the world for whatever anonymity may be left to salvage. Anyway, solve for “X” and good luck! Giveaway ends June 12, 2013. So Beat L.A.‘s finally published. Set in a downtown Los Angeles where gentrification seeks to displace the homeless, where loft dwellers walk their little dogs past dark alleyways from which the sickly sweet smell of something else wafts, Beat L.A. follows bicycle-jockeying police officer David Richter and cynical, unfulfilled patrolmen Brand and Reese in their Crown Vic. From the murky byways of the hard cityscape, they slam face-to-fist against a crack smoking lawyer, a one-armed crazed prophet, a hidden homeless enclave, a musclebound woman enforcer, a preacher with more than the Gospel on his mind, the devious Genghis Rabbit, mystic gangbangers, cartel funded property shenanigans, pandering politicians, and some big time development hanky-panky. As a bonus in Beat L.A. is “A to Z,” a prose short story that bridges the Bicycle Cop Dave and Brand & Reese stories, as well as an interview with Beat’s two writers, Gary Phillips and Tony Chavira. One corner of me is grateful that this book is finally done. Another, across from that corner, is overwhelmed that so many people are out there had enough faith in it (or us) to fund it. Yet another was shocked with awe that Florida publishers Down & Out Books took on publishing, marketing and distributing responsibilities. But the center of me, the largest part of my emotional floor plan, is a little sad that this project has ended. Sure, there’s still a little marketing/wining/bits of dining still involved in the process of advertising the graphic novel, but–for the most part–the hard part’s completely done. An artist/actress friend of mine, Hillary Bauman, once tried to describe to me the warm, nostalgic depression that arrives once a project finalizes and I distinctly remember brushing her off with a laugh and unsaid gestures implying that those depressed at a project’s successful completion must, likely, feel regret–in many ways–about the project’s execution. But no, that was wrong and wrongheaded of me. I feel it, down, just a little, just enough to feel that there’s still one more thing I can do, one more word I can write or one more drawings Mani and I can go back or forth on, just one more email to send to the printers or just one more phone call or meet-up with Gary and Nathan to confirm that we’re on some sort of track to get the book completed. No, it’s done now. All of that work, done, forever. And I know I need to move on. And I will of course. But at the moment, maybe I need to feel down and done. Time to absorb the exciting, dramatic conclusion, the long promised death (or rebirth) of my project, from nothingness to this, a page on Amazon.com: http://www.amazon.com/gp/product/1937495426. Unrated (thus far, anyway). I’ll get over it. I have three other things I’m working on at the moment. Still, if Beat L.A. could have a proper funeral, its life would seem to have more meaning. All it needs are a few eulogies. If you have the chance, I’d love to get your unbiased, thoughtful review of the final book. It would mean the world. Thanks to the efforts of a bunch of amazing people, Beat L.A.’s Kickstarter, to develop a published book to combine Gary Phillip’s Bike Cop Dave story and my Brand and Reese story, has been fully and unequivocally blessed by the gods of the internet and funded for publishing. 1) Get our cover done. I actually reached out to the amazing Bryan Lee (http://bchongle.daportfolio.com/gallery/420452) for a cover that conveys the dread and wildness Gary and I try to convey Beat L.A. So far, the images he’s set me are fantastic and I can’t wait to share the final cover. 2) Per the $150 reward perk, Gary and I are in the process of co-writing a short story that involves the names of the 6 individuals who gave us sizeable surges of moolah when we needed it most. The prose should fit in between Bike Cop Dave and Brand & Reese, and fuse the stories together nicely, albeit, savagely. 3) The printing of things. The comic printers need their copies as soon as we feel that things are in order, so that’s one thing. The script printers are ready, we just need to compile everything into a document that’ll be fun to read, with some sketches of Mani’s studies and maybe a few rough pages so everyone gets a sense of how things came together. 4) Determine our shipping date. Which should be figured out relatively soon. When I have an update, you’ll be the first to know! 5) Locking down an awesome writer to do a forward, which we’ve done. I can’t give anything away yet, but let’s just say that its someone whose definitely stood both in the sun and the shadows of Los Angeles, and–we think–knows just how strange living in this city can be. Man, who knew that doing a Kickstarter would involve such a quest for learning and the ins and outs of the publishing process. Better to learn now than never, right? Jerry, getting down to business. It’s been a while since I’ve posted a status update on the Brand & Reese webcomic itself, and so here we now are… up to page 70, with 30 more to go before le gran finale. No doubt you’ve noticed Gary Phillips’s and my respective ongoing comic series. 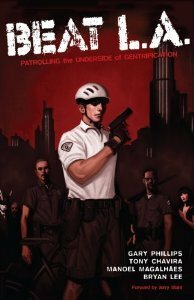 Bicycle Cop Dave, Gary’s hard-boiled rollercoaster of misdeeds unfolding from the darkest corners of Downtown Los Angeles has been published in full here at FourStory and can be read from page one right here: http://fourstory.org/comics/page/all-right-sylvia/. Given that we all love holding well-bound books in our pretty little hands (and that its a little more difficult to lick-and-flick pages on a website than an honest-to-goodness book), Gary, Nathan and I decided that it would be exciting to put together a Kickstarter campaign together to print out 1,000 tradepaper copies of Gary’s, Tony’s, and our kickass artist pal Manoel Magalhães’s full, interconnected supercomic, which we’ve titled Beat L.A.
Obviously, we’d love to see our baby in print, we’ve love for you to have a copy of your own (especially if you’ve been following along), and we’d love even more to see your support! So tell your friends, tell your parents, tell your local politicians and even tell their shady, anonymous contributors to click on this link, http://www.kickstarter.com/projects/753506845/beat-la, and help us fund our little printing project by picking up your own copy of Beat L.A.! Your support means the world to us and we can’t wait to see your happy faces when you open that package and tear through your own Beat L.A. tradeback. I mean, how can you say no to these smiling faces? So click here to head straight on over to our Kickstarter page and join in on the madness! I know it’s been a while since I’ve posted anything about Brand & Reese, but their story’s been marching on diligently nonetheless! Things have only gotten harder, stranger and murkier for the pair of down-and-out beat cops. Click either of the images to pick back up at page #43 and read on, my friends and fellow Angelenos. Lots of Brand & Reese to catch up on! I haven’t updated this on Minefield Wonderland in a while, pardon the interruption. So click on the link below and get up to speed! 3 New pages of Brand and Reese today catch the guys taking down a perp you probably recognize. Click on the image below to read! Three more pages of Brand & Reese today on FourStory, and the guys begin to see where the microcosms of downtown Los Angeles collide. Click the image link below to go to the latest and greatest pages! Click the image below to read away! Not everyone’s happy about a new Brand and Reese today on FourStory, as the boys inspect the gigantic homeless encampment. Click on the image below to read away! Three more pages of Brand & Reese on FourStory today, and it seems that many parties involved have to deal with the harsh aftermath of the shooting. Click on the picture below to go to the 3-page installment, or click here to start at the beginning and catch up properly. Three more pages of Brand & Reese on FourStory today, and the storylines collide for the first time. Click on the picture below to go to the 3-page installment, or click here to start at the beginning and read through the madness. Today’s Brand & Reese will hit home for sleazy developers in corrupt municipalities. Click the link below and read these next three pages. Today, pages 13, 14, and 15 of my police comic, Brand & Reese, posts and you get a insiders view of the kind of corrupt games developers play in the city of Los Angeles. Click on the picture below to read! Pages 10, 11 and 12 are up today on FourStory for my police comic, Brand & Reese. Click on the image below to read, or click here to start at the beginning of the comic! Pages 7, 8 and 9 are up today on FourStory, for my police comic, Brand & Reese. Click on the image below to read, or click here to start and the beginning of the comic! On FourStory, pages 4, 5, and 6 of my beat cop comic, Brand & Reese, went up today. Strangely enough, it happened on a day when I went to court and was lectured (along with a group of people) by a judge about jury duty being the highest form of citizenship. I’d say he is wrong though: public service that comes with no reward and no punishment is the highest form of citizenship. Always. In downtown Los Angeles, Officers Markus Brand and J.P. Reese become entangled in a struggle between local politicians, a sinister property developer, and the growing homeless community. Not sure if you had seen the link on this site, but the amazing artist (and close friend of mine) Josh Dunlap illustrates another online comic I write called Tuna Carpaccio P.I. Start at the beginning and read it though! I’m sure you’ll enjoy it! My next comic, Night Falls on the Sea, illustrated by the amazing Mr. Ahde Lahti, begins next Monday! Thanks everyone!